Congratulations on your upcoming nuptials! What a blessed and happy time in your life, a time that I am delighted to contribute to in a small way. Take a breath and relax. This is the fun part! I have been singing for weddings for 15 years. I consider singing for weddings one of the most joyous and beautiful things I get to do as a musician. Hopefully, your wedding day will be one that you remember as one of the happiest days of your life. I would love to play a small role in contributing to your joy and the beauty of your day. I am available both as a vocalist alone, as well as vocalist and pianist. 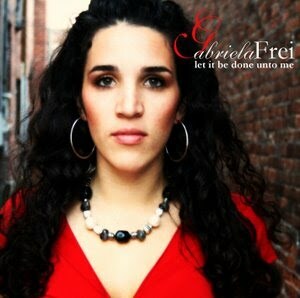 Please contact me for availability and fees at gabriela@gabrielafrei.com. for which you will need music. The following link will take you to a page with a list of wedding music that I have compiled through the weddings I've done. This list of wedding music is by no means meant to be an all-encompassing list. There is so much music available for weddings. As you come up with your own ideas, please contact me and I will help you make your final selections. Please check with your parish’s director of music to see what his/her policies are in regards to wedding ceremony music. Each parish is unique in its allowance of either contemporary praise and worship or secular love songs within the marriage liturgy. or by searching for the song on YouTube. Enjoy!